Java Magazine za srpanj/kolovoz 2012. Developer Power! 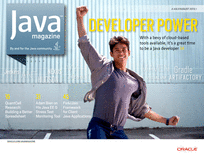 With a bevy of cloud-based tools available, it’s a great time to be a Java developer. Building a Better Spreadsheet Java powers analytic breakthroughs at Quantcell Research. Java HotSpot’s Hidden Treasure Try this debugging tool. Oracle Berkeley DB Java Edition’s Java API Ted Neward shows us how this Java API works. Fix This Try our ConnectionPool.java code teaser.